If you have milking goats you should try this delicious creamy goats milk yogurt. Castration Bander: To castrate your young bucks. Ideally this is done between 8-12 weeks to avoid ureter stone blockages. Cornstarch: For absorbing moisture – help cleaning poopy bottoms. To stop bleeding of the hooves when cut too close. Dental floss or cotton: If for some reason the umbilical cord is still bleeding, you can tie it off about an inch from the abdomen. Hoof Shears: To keep your goat’s hooves trimmed and free of footrot. Iodine: Can be used to wipe around wounds/abscess before treatment/lancing. Can be diluted and used to flush wounds that appear infected. Good to spray on footrot. KY Jelly: For use with rectal thermometer or if you need to assist in birthing. Liquid soap or soap flakes: To use as lubrication to assist in birthing. Milk powder or frozen colostrum: For feeding weak or sick kids. Rectal Thermometer: Digital is easiest. Rubber Gloves: In case you don’t want that birthing muck on your hands. Soft Rope: To tie around a foot or head to assist in birthing. Styptic Powder: to stop bleeding of the hooves when they are cut too short – Not to be used on the skin. Can use Cornstarch. Towels: Old towels to dry wet goats or kids, wrap heat pads and help hold goats during treatment. Tube Kit: For feeding weak kids straight into their stomach. See here for how to do this safely. Herbal remedies are great to add to your goat’s diet to keep them healthy. They are also easy to grow or find in the wild. Keep them on hand in the garden, or dry them and add them to your rabbit first aid kit. 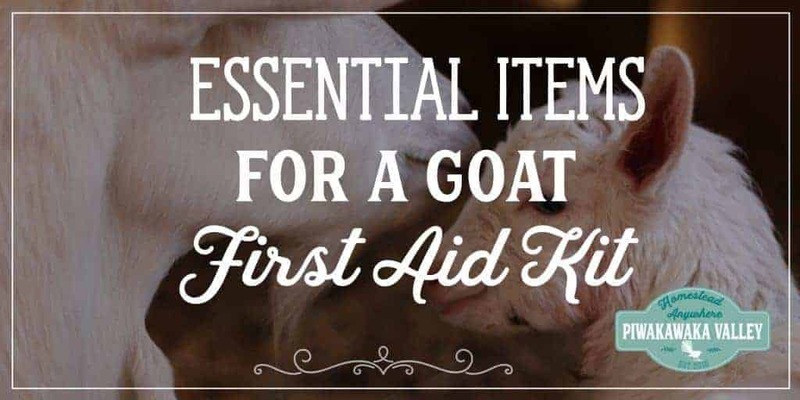 What do you have in your goat first aid kit? Let me know in the comments below!